We are off and running into 2013. There are so many opinions about what the year will bring for property owners, but we are not running our business on theory, we are just getting on with the job. 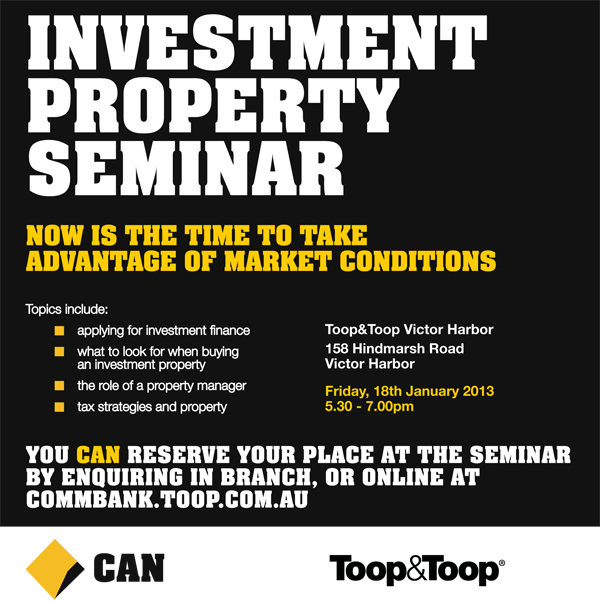 So let's get this real estate party started with the 2013 opening season Investment Property Seminar, a joint seminar with Commonwealth Bank which will be held at our Victor Harbor office. It's time to take your first step, time to make things happen! OPINION: I am personally backing the Fleurieu as the place that has some of South Australia's very best real estate opportunities. I believe buying here in 2013 will prove very smart indeed. And we are putting our money where our mouth is. We have doubled the size of our real estate floor space at our Victor Harbor office to create the "Fleurieu Real Estate Gallery" - a place which will visually showcase what the Fleurieu has to offer in terms of holiday letting, long-term rentals and what is available for sale. We will officially be opening the Gallery on Friday 18th January in conjunction with our Investment Property Seminar. And you are all invited - yes, even all real estate practitioners! Come along to see our brand new Gallery and stay for the investment seminar (details below). WHY BOTHER? Life is way too short to put on hold. We have had two years of playing scared of what may or may not happen in the economy. In my world of dealing with cancer, there is a term called "catastrophising". This is where you have mental pictures of everything going wrong and you are continually looking at the worst possible case scenario; you start to focus and believe that unrealistically bad things are about to happen. The antidote is to look at what is actually happening and deal with just the facts. In real estate, the facts are that prices have dropped, rents are staying stable and funding costs have reduced a lot. Residential real estate is looking pretty attractive as an option right now. As I have stated often lately: the worst hit areas - with the most potential to rebound - are where we should be focused, and the Fleurieu in my opinion ticks all the boxes. WHY THE FLEURIEU? We have an aging population who increasingly need to be close to medical facilities, people who are looking for a laid-back lifestyle and activities that are not too expensive. As we age, we also want a quality environment, pretty scenery, to be close to major transport and cultural centres, have all government facilities and support systems readily available... and given that our incomes may be affected, we also need to live cheaply. Think about what ticks all those boxes... what is close to Adelaide and has very affordable housing, yet is high class? A place where there are endless activities such as fishing, skiing, sailing, surfing, wineries, tourist destinations, restaurants, golf, bird watching, whale watching, great weather and great scenery? You guessed it... it's the Fleurieu! Imagine the impact that the new expressway will have to further ease access and link all this together. The new RAH and our International airport just over an hour away... it's the Fleurieu. Rents are cheap, houses are cheap and cost of living is cheap. AND for all this value, it really is an awesome place to live. Even for the rich and famous... it's the Fleurieu. TIME TO TAKE ACTION! So take the first step and come along to our joint Commonwealth Bank Toop&Toop Investment Property Seminar and at the same time check out first hand the soon to be opened Toop&Toop Fleurieu Real Estate Gallery. Everyone is welcome and it's FREE. Also, for the statistics junkies, here's the first RP Data report for 2013, with the latest stats and figures on Australian real estate. Let's real estate rock South Australia in 2013!